Why Are We Repainting the Original Background Screens? One of the major tasks I’ve set for myself prior to the release of episode one is bringing artistic consistency from screen to screen and within environments as a whole. Thus, a lot of game environments that were initially conceived and painted as standalone 800×600 screens are being converted into more organic scrolling areas that give the whole game a more modern feel. Another issue I’m addressing is consistency of painting styles between the different artists who contributed to episode one during our first production cycle. For example, in some screens the underlying pencil work is really obvious, i.e. the colorist allowed all of the pencil shading to show through. In other screens, the colorist painted over the pencil strokes and you can barely tell it was originally conceived as a paper-and-pencil drawing. This also gives me the chance to make some tiny corrections and additions that I’ve wanted to do for a while. For example, when I designed this crossroads screen I hadn’t yet come up with a design for the town off in the distance. Thus, the town appears very generic in the original screen, whereas in the new screen it actually matches the look and layout of the town, which you’ll get to explore in episode two. Vulture Rock off in the distance has also moved to fit better into the geography of the game world. Although these changes may push back the release of episode one, I think it will be well worth the wait. We’ve been hard at work on getting the character designs finalized for the first episode. 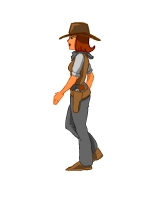 One of the major players throughout the whole game is Mary Jane Clayton, a rival treasure hunter and potential love interest for our here, ‘Rattlesnake’ Jake Dawson. She plays a small role in the story near the end of episode one. Here she is in all her animated glory. Artist Jim Peebles of Peebles Productions did the work on this sprite.